Index Plates assure that a part will not unexpectedly rotate due to vibration or impact loads. Some non-gearbox Rotational Holding Fixtures are supplied with a rotational brake, but it is not fail-safe. Gearbox type Rotational Holding Fixtures use inherently self-locking worm gears but can move when subjected to certain types of vibration or impact loads. Flotron recommends that all Rotational Holding Fixtures be ordered with the optional Index Plate. The standard hole-pattern on Index Plates has holes located at 15-degree increments, which adequately suits most applications. An additional advantage of an Index Plate is that it can withstand higher accidental torque loads than a Gearbox and although it may not prevent damage to the Gearbox, it may prevent damage to the load or injury to the operator. Must be fully inserted into the Index Plate in order to assure that unexpected rotation of the part will not occur, which in turn could cause injury or property damage. Index Plate Ball Lock Pins must be fully removed from the Index Plate prior to attempting to rotate the part with the Gearbox. Unexpected Accident Loads can break the rotation Gearbox and potentially cause serious injury or property damage. At a minimum, Flotron recommends that a Holding Fixture be specified which will withstand an “accident load” of 200-pounds (as in a 200 lb person) at the maximum swing radius of the part Plus the “normal” Gearbox working torque rating (see the appropriate data sheet). If these loads are imposed (with an overall “accident torque” yield strength safety factor of 1.2) and solved for a maximum recommended swing radius, we get the data shown in the following table. *200 lbs at any “reasonable” swing radius does not significantly affect the rating for this gearbox. However, other types of accident loads may need to be considered such as loads from other handling equipment. Main Beam Lock Knobs must be tightened prior to moving a Rotational Holding Fixture. If they are not tight, the End Frames may move on the Main Beams and potentially cause serious injury or property damage. Main Beam Safety Stop Bolts must be installed and properly tightened at both ends of the Main Beam prior to using a Rotational Holding Fixture. Main Beam Safety Stop Bolts prevent the End Frames from inadvertently slipping off of the end of the Main Beam either during adjustment or due to an operator forgetting to tighten the Main Beam Lock Knobs. If an End Frame accidentally slips off of a Main Beam, serious injury or property damage may result. Riser Ball Lock Pins (on larger units) must be fully inserted or Riser Lock Knobs (on smaller units) must be properly tightened prior to using a Rotational Holding Fixture. Also, prior to adjusting the riser height, an upward force must be applied to the riser assembly to unload the riser pin or knob. Pulling the riser pin or knob from an unsupported riser will allow the riser to suddenly drop. Unexpected movement of a Riser can cause serious injury or property damage. 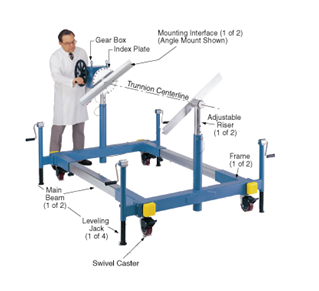 Do not adjust the length of a Rotational Holding Fixture to a point where the length between the Casters is less that the width between the Casters. Adjusting the length to too small a dimension will greatly increase the possibility of tip-over, which could cause injury or property damage. If a very short part must be held, make an intermediate frame to hold your part that will allow the Rotational Holding Fixture length to remain at a safe length. Injury or property damage could result from breakage due to damage or corrosion. The Caster Brakes are an “on-off” type and designed for use only when unit is “parked”. They are of no use in attempting to limit speed when descending a grade. A “run-away” Rotational Holding Fixture on a grade could cause injury or property damage.